Trump is very clear when he says that gays do not deserve any rights at all and marriage is out of the question. American Family Association spokesdouche Bryan Fischer is worried that Donald Trump doesn't hate gay people enough to earn the endorsement of the right wing. Does he believe the Defense of Marriage Act (DOMA) is constitutional? Does he believe President Obama violated his oath of office by refusing to defend this law in court? Does he support a federal marriage amendment that would define marriage as a one-man, one-woman institution and prohibit marriage counterfeits like civil unions and domestic partnerships? Would he reverse President Obama’s decision to grant certain spousal benefits to the sexual partners of homosexuals, contrary to DOMA? Would he support reinstatement of the ban on open homosexual service in the military? Would he veto the Employment Non-Discrimination Act (ENDA) if it came to his desk? Would he sign a repeal of the Hate Crimes act, which will criminalize speech that is critical of homosexual behavior? 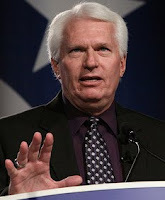 Fischer also says that Trump's three marriages "ought to be a huge problem for social conservatives," an issue Fischer doesn't seem to have with thrice-married serial adulterer Newt Gingrich, who regularly appears on Fischer's radio show.